Remember there is power in numbers! We are focusing on making phone calls to Senator Blunts office for the rest of this week. EVERY DAY from 8am-4pm please call his WASHINGTON DC office. Make it a part of your daily routine!!!! Emails are good, but 2,000 phone calls everyday will make a bigger impact!!! If you have to call before or after hours you can always leave a message. Report back… here in a comment to this post that you have called. Senator Blunt, is in the leadership of the Senate majority party as well as sits on several appropriations subcommittees, including for the environment and the military. The best opportunity to put the Army Corps of Engineers FUSRAP in charge of the West Lake Landfill is legislatively before the end of the year. We are beginning our outreach with him because of the reasons we just detailed and the fact the House of Representatives is focused on finding a new Speaker. Let Senator Blunt know we desperately need his help to reach our goals. 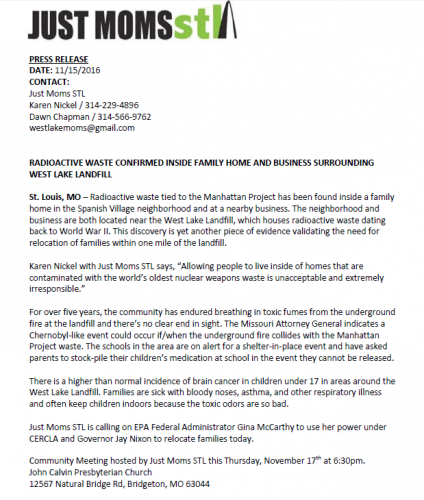 1) Immediate permanent relocation for homeowners and renting families that want to move that are located within one mile of the West Lake Landfill fence line, paid for by the landfill owner, Republic Services. 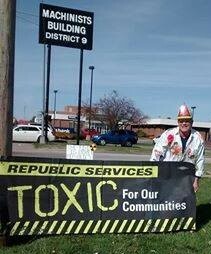 2) Provide fair market value assurance for homeowners living within five miles of the West Lake Landfill ,(for five years or until the fire is out, whichever is longer), paid for by the landfill owner, Republic Services. 3) Authorize the Army Corps of Engineers FUSRAP to take charge of the cleanup. 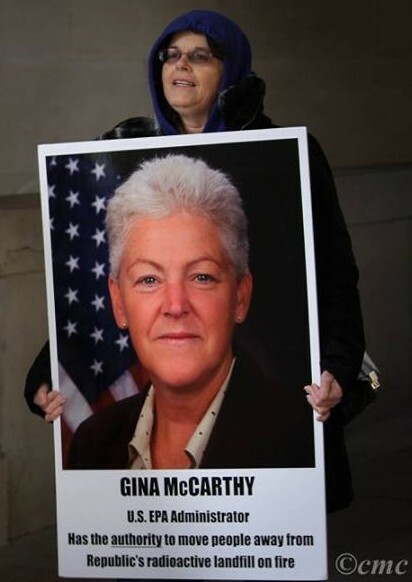 They are the most qualified government agency to provide a safe and permanent solution for the radioactive wastes, offer better protection for workers, and have a program for health care assistance for the public. Please “share” this post with your friends….Don’t forget to report back to this post that you have called!! 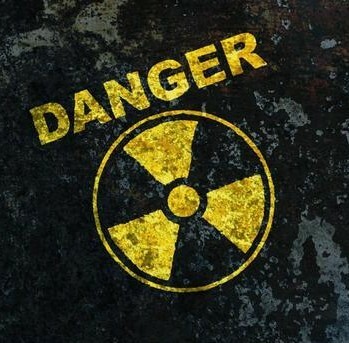 The U.S. Environmental Protection Agency will soon begin testing a popular athletic complex in Bridgeton for radiation. The EPA will scan all the outdoor areas of the Bridgeton Municipal Athletic Complex, except the parking lots, for gamma radiation. The playing fields will remain open in the meantime. Radiation screening at the Bridgeton Municipal Athletic Complex (BMAC) is scheduled to begin the week of May 19. Brooks was referring to the donation of a radiation detector to Maryland Heights mother and citizen activist Dawn Chapman. An attorney who is suing West Lake Landfill owner Republic Services gave her the $16,000 detector. 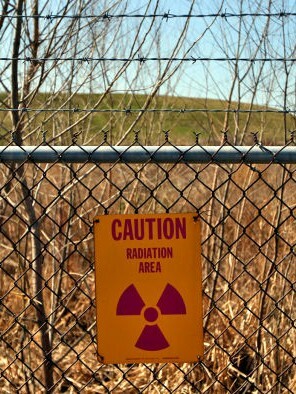 Chapman and other area residents are concerned that radioactive material at the West Lake Landfill may have contaminated surrounding neighborhoods. After receiving the detector, Chapman did her own testing. She said she detected an “unusual spike” in radiation in a drainage ditch at the Bridgeton athletic complex. The ball fields are less than a mile down Taussig Road from the landfill. 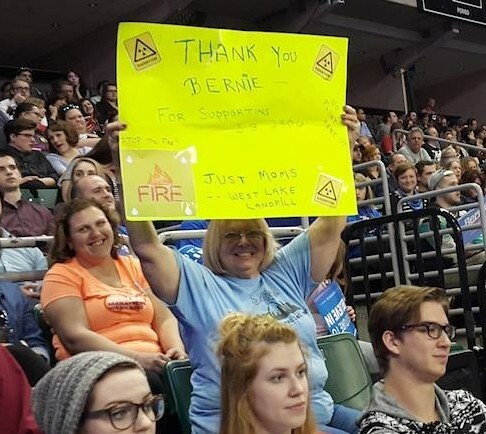 Chapman and her non-profit group, Just Moms STL, also helped raise several thousand dollars to have soil samples collected from the ball fields analyzed for radioactivity by a laboratory in Massachusetts. The group made those results public on Wednesday. 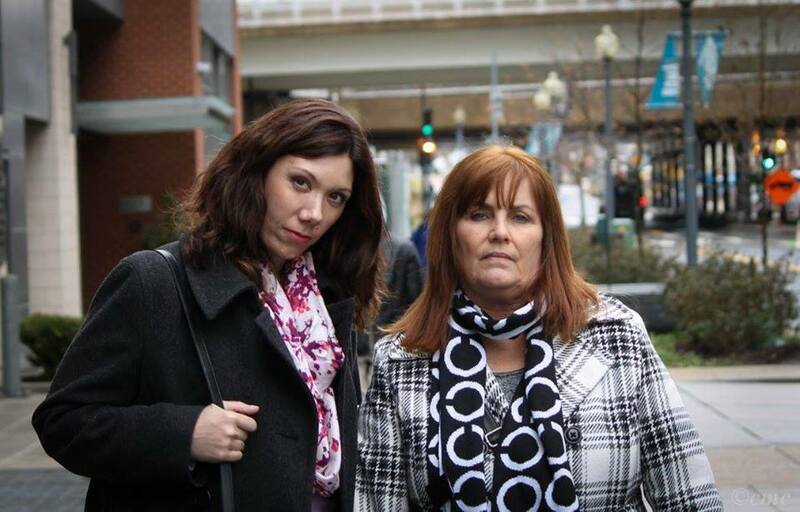 In a press release, Just Moms STL said one sample had “an abnormal concentration of radioactive lead” (210Pb) and that several other samples were also “well above background” in terms of their radiation levels. St. Louis Public Radio’s call to the Massachusetts lab was returned by Chicago-based nuclear industry blogger Lucas Hixson, who collected the soil samples. Hixson and nuclear policy analyst Robert Alvarez have been working with Chapman and Just Moms STL to test sites around the West Lake Landfill for radiation. Hixson said the soil samples would be sent to another lab for further analysis and characterization, and to determine whether any of the detected radioactivity exceeds regulatory safety levels. Area residents listen to EPA Regional Administrator Karl Brooks and Bridgeton Mayor Conrad Bowers during a press conference on Friday. Chapman said she and others were still trying to raise the finds to pay for that more detailed analysis. During a conference call with news reporters Wednesday afternoon, the director of public affairs for EPA Region 7, Curtis Carey, said his agency does not believe Chapman’s testing “provides a sound basis” for the community to make decisions about the safety of the ball fields. “We don’t know if that equipment was calibrated, if the operator was trained, if appropriate protocols were followed,” Carey said. A baseball tournament scheduled to take place in Bridgeton this past weekend was moved due to concern over potential contamination. West Lake Landfill Superfund Site On-Scene Coordinator James Johnson demonstrates EPA’s Rapid Assessment Tool (RAT). The EPA will use it to scan the Bridgeton athletic complex for gamma radiation. The EPA will start by screening the athletic complex for gamma radiation. If that preliminary assessment detects elevated levels of radiation anywhere on the ball fields, soil samples will be collected from those sites and tested for radium-226 and thorium-230. At a press conference on Friday, EPA Regional Administrator Karl Brooks said it would take at least a week to complete the testing, and then another 30 to 45 days after that to get the final results. That means the earliest the EPA would release results to the public is in late June. Brooks said children can continue playing at BMAC in the meantime. “There is no credible scientific information that would justify this agency in directing the city to change the uses at BMAC, or should justify the city itself in changing those uses,” Brooks said. The Missouri Department of Natural Resources did limited radiation testing at BMAC a year ago (see samples 8A and 8B in Fig. 1 on p.4 of this report), but that testing was intended to look for contaminated dust blowing off the West Lake Landfill, not for contaminated soil. Brooks said testing conducted in the vicinity of the athletic complex by the U.S. Army Corps of Engineers in the early 2000s also did not find evidence of radioactive contamination. But he confirmed that this would be the first time that the ball fields themselves would undergo a complete scan. Dawn Chapman said the community has been asking the EPA to run its own tests, and she’s thrilled that’s finally going to happen. 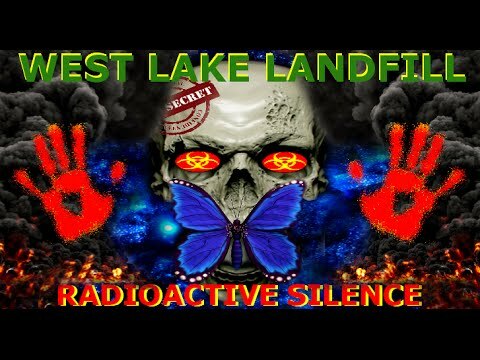 Why are Lafayette County Republicans interested in West Lake Landfill? 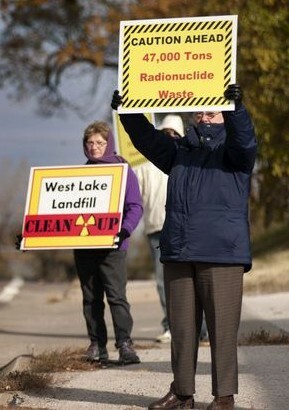 Why do Republican leaders in a rural county outside Kansas City care so much about a radioactive landfill in Bridgeton? They are concerned about the possibility of nuclear waste being hauled through their area. They also have connections to the landfill’s owner, Republic Services. 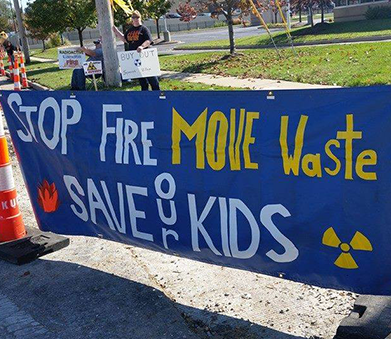 Republic Services recently launched the Coalition to Keep Us Safe, a lobbying group to promote keeping the nuclear waste buried at West Lake Landfill. The coalition’s hired spokeswoman Molly Teichman is from Warrensburg, one hour southeast of Kansas City. Teichman is a conversative blogger who is connected to the Lafayette County Republicans. State Rep. Glen Kolkmeyer is a Republican from Lafayette County and is an outspoken supporter of the coalition. Teichman and Kolkmeyer are longtime friends of Kay Hoflander, chair of the Lafayette County Republicans, who has distributed press releases for the coalition. Hoflander’s son, Russ Knocke, is the director of field communications and public affairs for landfill owner Republic Services. 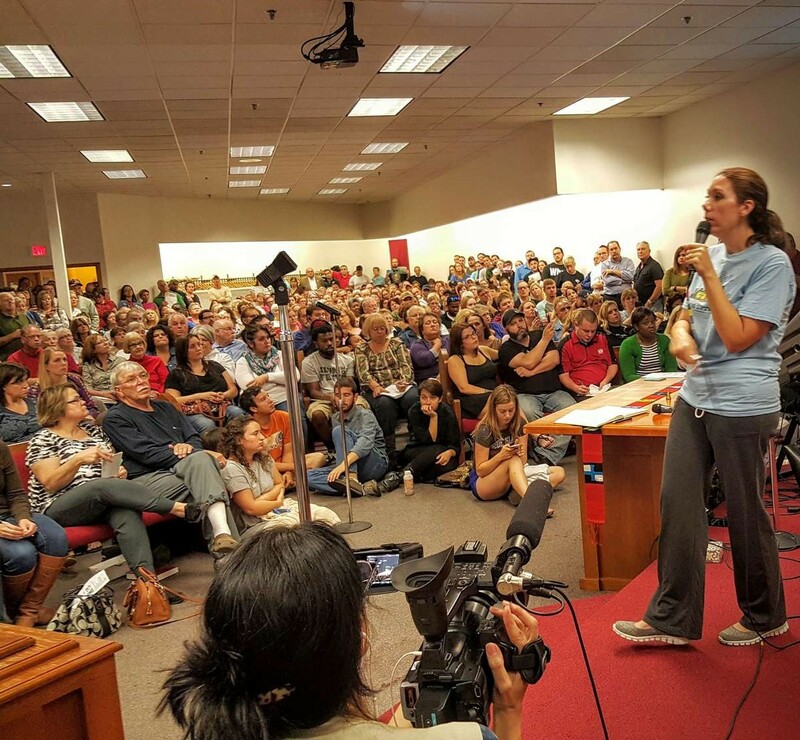 Hundreds of residents of Bridgeton, Maryland Heights and nearby areas have been pushing for years for the cleanup of West Lake Landfill. An underground fire at the adjacent Bridgeton Landfill has brought increased attention from Missouri’s U.S. senators, local environmental groups and the media. The U.S. Environmental Protection Agency is reevaluating its 2008 decision to place a rock, clay and soil cap over West Lake because of public opposition and concerns about the fire, which could damage the cap. Under the EPA’s Superfund site program, Republic Services is at least partly responsible for the cleanup costs at West Lake. One of the options the EPA is considering would involve the excavation and transport of the waste by covered rail to a nuclear storage facility in the western U.S. Nuclear waste from other sites downtown and near the airport has been hauled out of the St. Louis area this way since the 1990s. 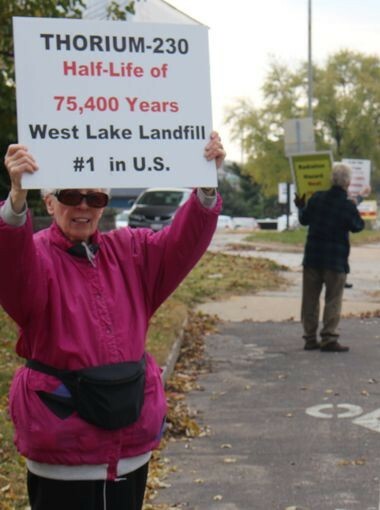 The coalition against hauling the West Lake waste claims 30 supporters from across the state who are labeled concerned citizens, veterans or environmentalists. They are listed on the website only by a first name and last initial. The coalition’s spokeswoman Teichman said none of them can be interviewed because it is an emotional topic and they would be subject to ridicule. Dan’s Automotive Service is at the end of Boenker Lane.It is where the world ends. Right up against Dan’s place is Hades. Hades pops up out of the earth and rises like a blister from the soil. A huge hill of waste, a fire simmering underground, radioactive waste somewhere nearby. A heavy-duty tarp has been placed over the hill. Pipes stick out of the tarp. A constant hissing sound is heard as pumps push gas and water out through the pipes. An odor often drifts from the blister. “It can get rank,” said Dan Rose. Such is life next to the Bridgeton Landfill. Not a bad life, actually. Dan’s Automotive Service has been a successful business for years. It has provided a living for Rose, his wife and two full-time mechanics. But last month, the owners of the landfill gave Rose notice. They need his land for a leachate line, part of a construction project designed to control odors. Rose has to shut his business at the end of this month. The fellow who told me about the auto shop warned me that it would look run-down. It does. Why shouldn’t it? It gets no drive-by traffic. Rose does no advertising. Business comes by word of mouth. Honest, quality work in a bad location. If you don’t mind coming right next to Hades — I mean right next to Hades! — and you don’t expect a fancy waiting room, this could be your repair shop. Rose also does state inspections. He has worked at this spot since 1970. That’s when Dean’s Automotive Service moved to the site. Rose had been working as a mechanic at Dean’s since graduating from Ritenour High School in 1968. Back in 1970, the landfill was a quarry. A hole in the ground. He bought the business from Dean in 1984. Dean’s Automotive Service became Dan’s Automotive Service. Rose had a lease. The years went by. Rose and his wife raised their three children. They employed people. They paid taxes. 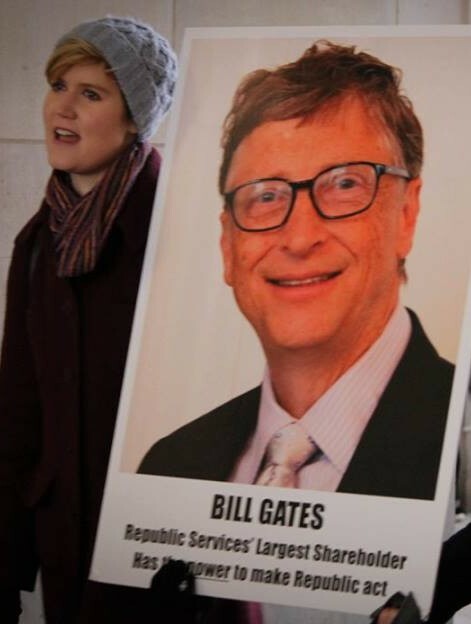 They did not get rich. That was fine. Rose had a plan. He’d work until he was 65 or 66, and then he’d sell the business and retire. The sale of the business would provide him with a nest egg, which would be supplemented with Social Security. Eventually, the quarry became a hill of waste. Then things got messy. In 2010, elevated temperatures were detected in gas extraction wells. Tests revealed a “subsurface smoldering event.” Laypeople call it an underground fire. Technically, it is not a traditional fire, but a chemical reaction that produces high temperatures. 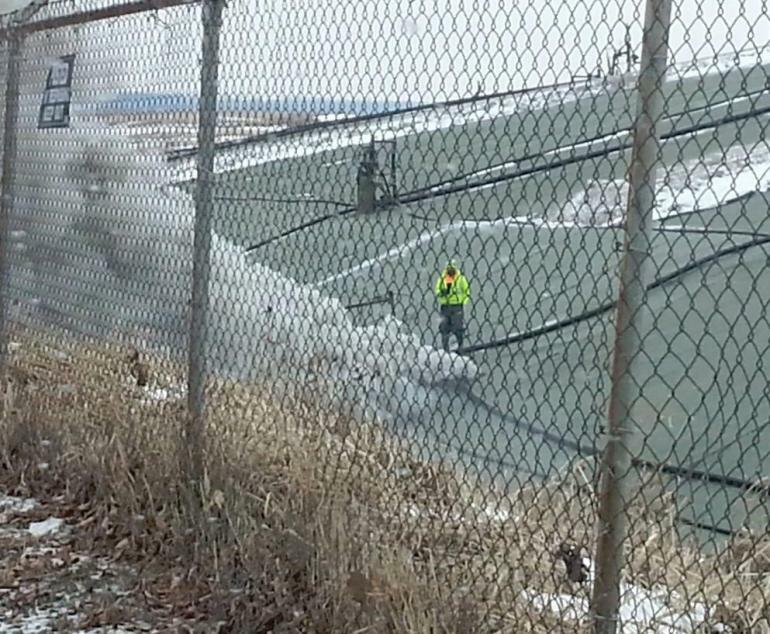 The underground fire, or subsurface smoldering event, was headed toward the radioactive waste in the nearby West Lake Landfill. Last year, the attorney general said the fire was 1,000 feet from that waste. Estimates were that the smoldering event would reach the radioactive waste in one to three years. 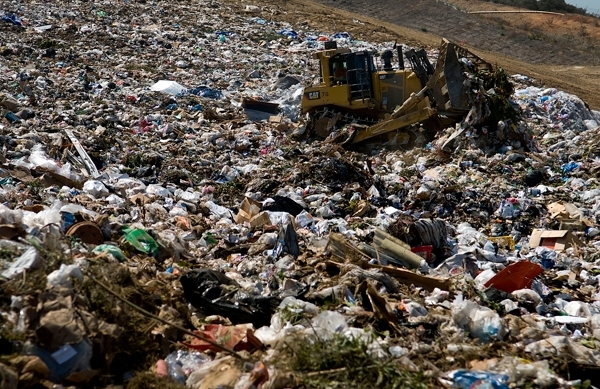 Then a “landfill expert” told St. Louis Public Radio that if the chemical reaction consumed enough material to cause a hole underground, the landfill could cave in and the smoldering event could reach the surface as a real fire and spread more quickly. What I mean is, there was no good news. Rose figured his time was limited. He was not surprised to get the heave-ho. It was, as these things go, a gentle heave-ho. He was given a $10,000 termination payment that was not part of any agreement. His lease was the last of several to be terminated. Still, he is now 64. He will have no business to sell. Unless he can find a place to move — and it will be hard to match the $800 monthly rent he was paying — he will probably have to sell his equipment at auction. Then he will have to look for work himself, or retire a little earlier than he had planned. 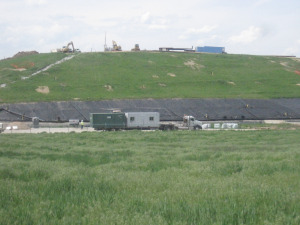 Republic Services, the Arizona firm that owns both the Bridgeton Landfill and the West Lake Landfill, is Rose’s landlord and has been since it bought his property in 2008. Callow added that Dan’s Automotive Service used to repair facility vehicles and was a favorite of the local manager. 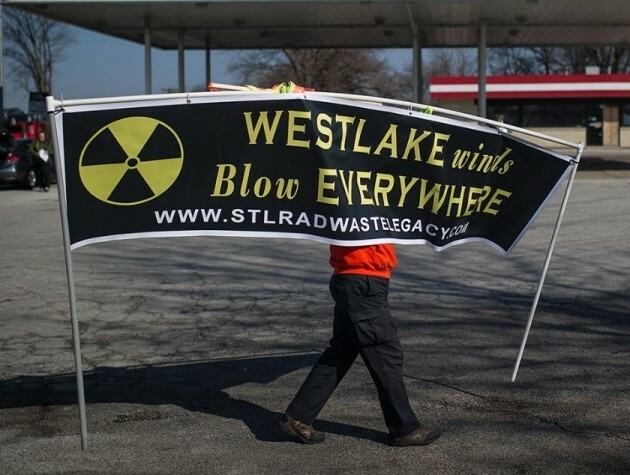 Republic Services, the company that owns the radioactive West Lake Landfill in Bridgeton, has launched a lobbying group that is pushing to keep the waste buried instead of hauling it to a nuclear dump site in the western U.S. 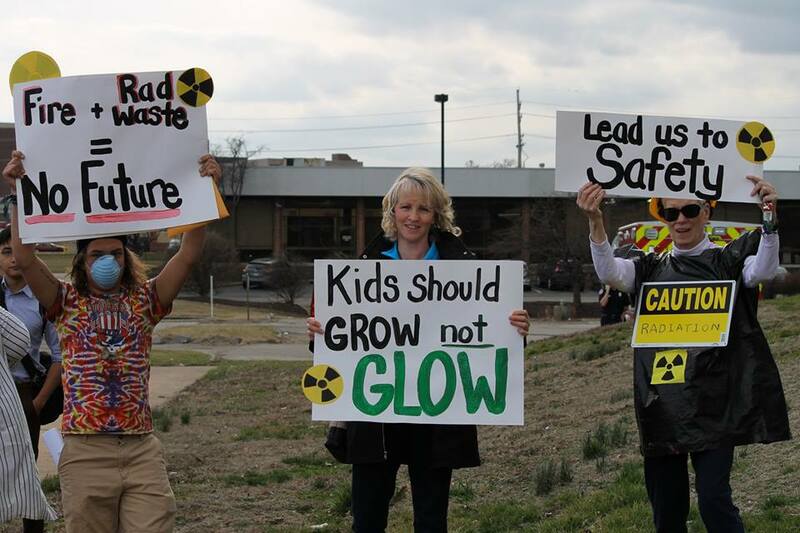 The goal of the Coalition to Keep Us Safe is to raise support among legislators and the public for the U.S. Environmental Protection Agency’s 2008 decision to place a rock, clay and soil cap over the West Lake Landfill. 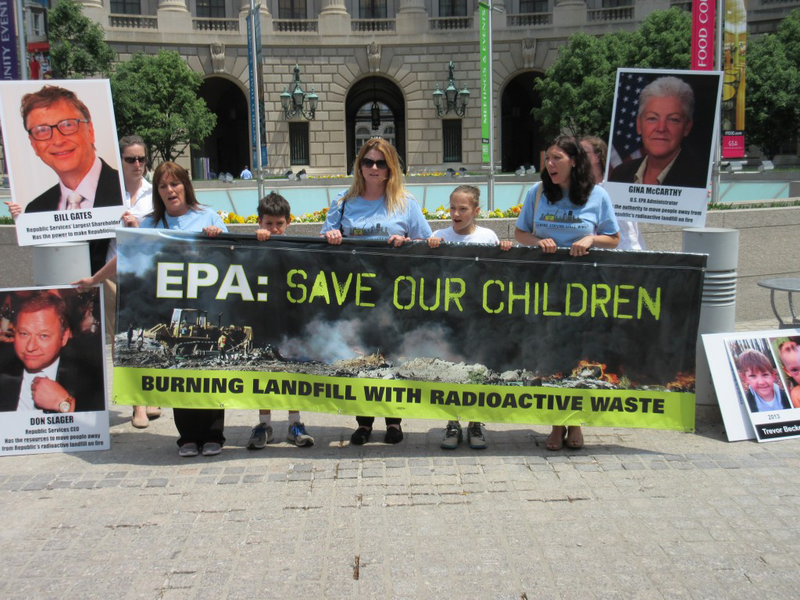 The EPA is re-evaluating that plan because of public opposition and concerns about an underground fire at the adjacent Bridgeton Landfill that has smoldered for more than three years. The agency’s most recent research shows the cap would not be adequate to contain toxic fumes if the smoldering reaches West Lake Landfill. Under the EPA’s Superfund site program, Republic Services is at least partly responsible for the cleanup costs at West Lake. One of the options the EPA is considering would involve the excavation and transport of the waste by covered rail to an out-of-state nuclear storage facility. The coalition supports the cap “as the safest and most effective option for protecting the communities near the landfill as well as across the state of Missouri.” Supporters listed on the group’s website include Daniel Mehan, president of the Missouri Chamber of Commerce, four Republican state representatives and the Cooper County sheriff. Republic Services is one of the chamber’s top donors. Republic Services hired Kansas City-based Molly Teichman, a conservative political commentator, to handle public relations for the coalition. Teichman said the coalition’s supporters could lose their jobs if they were quoted in the Post-Dispatch. 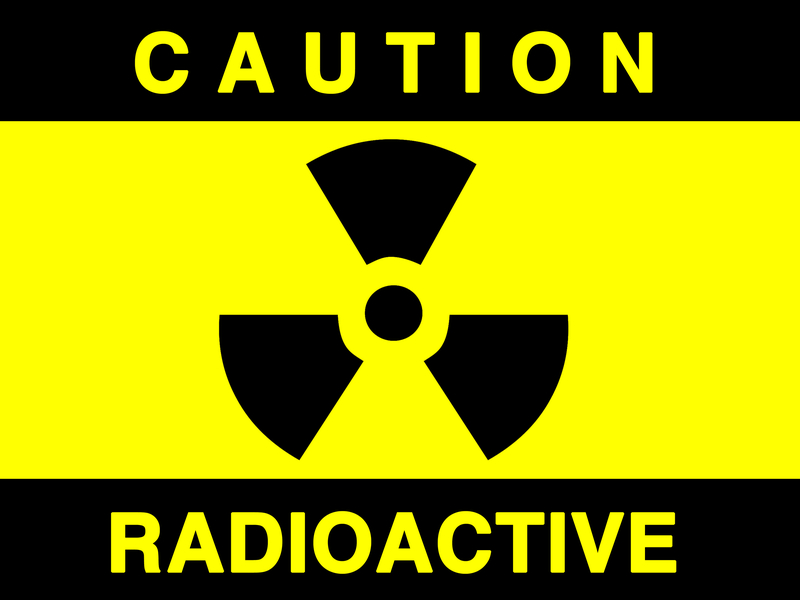 The coalition has been calling residents in rural Missouri “to help the public understand the risks associated with excavating and transporting nuclear material across the state,” Teichman said. Some residents believed that the calls were coming from the EPA, leading the federal agency to issue a statement denying any involvement. State Rep. Bill Otto, D-St. Charles, said the coalition is using scare tactics without fully informing the public. 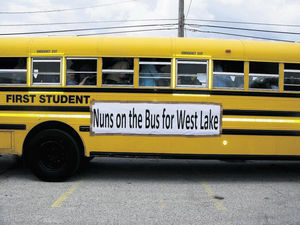 “It’s an attempt to go outside the metro area to gain support against St. Louis and St. Charles counties,” Otto said. People who support excavating the waste point out that similar cleanup efforts have been ongoing around St. Louis since the 1990s. The Army Corps of Engineers, which has been asked to assist with cleanup at West Lake, has handled the transportation of nuclear waste from sites downtown and around the airport. More than 600,000 cubic yards of contaminated material have been shipped by rail through Missouri. West Lake has an estimated 150,000 cubic yards of radioactive waste, according to the state health department. One of the coalition’s supporters, state Rep. Glen Kolkmeyer, said, “I do not want to see (West Lake) dug up and put on rail, which would likely come through my district.” Kolkmeyer, a Republican who represents parts of Jackson, Johnson and Lafayette counties, said he was unaware that radioactive waste already is transported across the state. 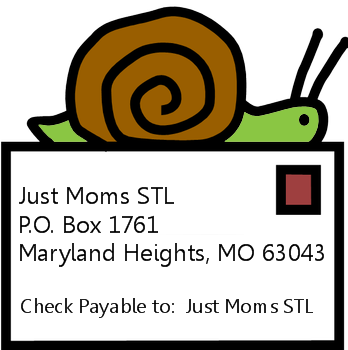 Another group, Just Moms StL, supports a quick and safe resolution at West Lake Landfill. 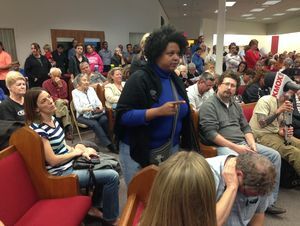 The group has hosted regular community meetings since 2012. Won’t somebody please take responsibility for the landfill with the smoldering event? The hot-potato game being played by state and federal officials, legal representatives and Republic Services, operator of the Bridgeton and West Lake landfills, isn’t fair to the people who live in the area. 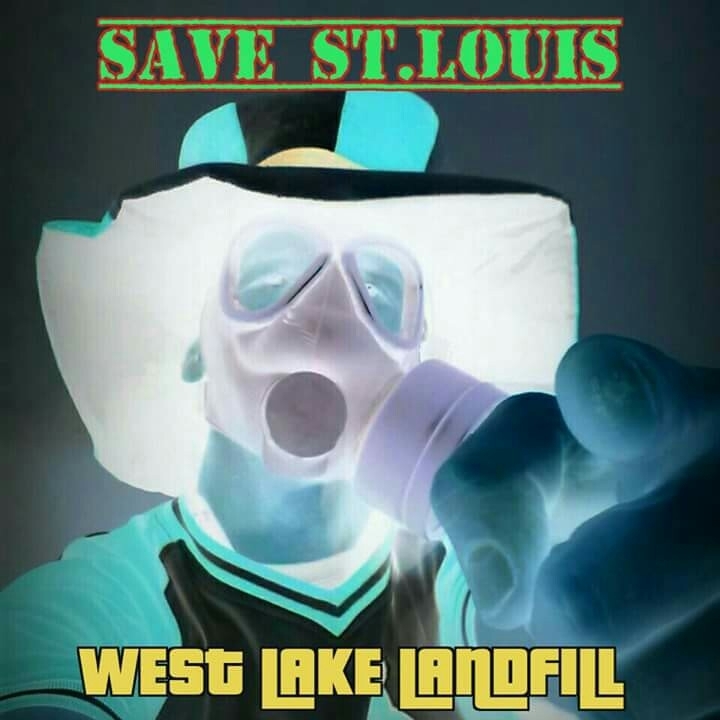 If the game doesn’t stop soon, and critics’ worst-case scenario is realized — that the underground fire in the Bridgeton Landfill reaches the thousands of tons of radioactive waste in the adjacent West Lake Landfill — there could be severe environmental consequences. Attorney General Chris Koster came out swinging a year ago. He filed a lawsuit against Republic alleging violations of environmental law and said he would “aggressively” track the company’s compliance. The lawsuit also gave Mr. Koster’s office authority to levy fines of $10,000 a day for each day of each violation if deadlines for reducing odors at the landfills were not met. A year later finds this aggressiveness gone. Mr. Koster has his bat on his shoulder. He is not imposing the fines, and a spokesman for his office says Republic has “taken some intermediate steps to reduce the intensity of the odors.” This refers to a cap that was put on the Bridgeton Landfill in August. Apparently that’s good enough. Nearby residents and workers say the cap helped things at first, but the smell got worse over the winter months. A log of complaints about the odor kept by the state Department of Natural Resources shows they have increased since the cap was put in place and as more people in the area learned about the log. The log was obtained by Post-Dispatch reporter Blythe Bernhard. Federal and state health officials maintain that the odors pose no health risks other than headache, nausea and fatigue. They don’t seem to think those are big enough problems to warrant more aggressive tactics — like fines — to get the odors under control. But then they don’t live near the landfill. 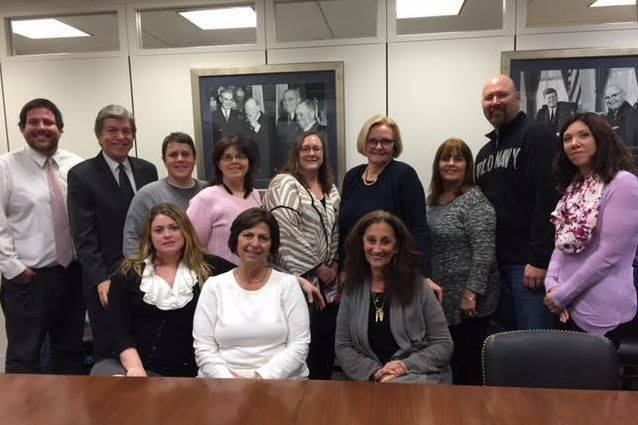 Missouri’s congressional delegation — Sens. Roy Blunt and Claire McCaskill and district Reps. William Lacy Clay and Ann Wagner — have asked for the Army Corps of Engineers to work with the Environmental Protection Agency to handle the waste. 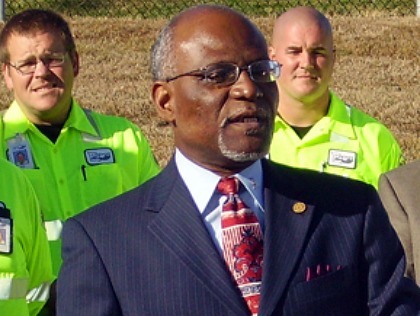 The St. Louis County Council, County Executive Charlie Dooley, nearby DePaul Health Center, the Pattonville School District and the North County Incorporated business development group have asked the corps to handle the cleanup under its Formerly Utilized Sites Remedial Action Program. These are steps in the right direction and a worthy bipartisan effort. But, like the smoldering event itself, they may be generating a lot of heat but no flame. So far the requests have led only to an agreement to have the corps help build an isolation barrier to separate the waste in West Lake from the fire in Bridgeton. There are other concerns. An EPA study shows “possible relocation of radioactive material,” meaning that it may have found its way to the Bridgeton Landfill, Mr. Koster said in a recent letter to the EPA and Republic Services. He said if radioactive waste is found in the Bridgeton Landfill, the federal government needs to take over the entire project. State regulators are tracking the underground fire in the Bridgeton Landfill; the EPA oversees West Lake as a Superfund site. The fire has been smoldering for more than three years. In 2008 the EPA’s Region 7 office in Lenexa, Kan., which oversees West Lake, made the decision to leave the waste in place and cover it with a protective cap. 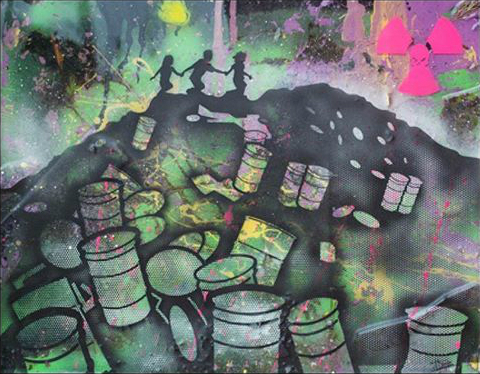 To recap: The EPA, the state Department of Natural Resources, the state attorney general, two U.S. senators, two U.S. representatives and the Corps of Engineers are all involved, plus the private corporation that owns the landfills. Involvement is good. Somebody deciding to take it upon himself to get it fixed would be better. Karl Brooks, regional administrator for Region 7, said the agency is listening to the residents. As evidence, he offers the fact that the EPA agreed to take a second look at their earlier decision. Mr. Brooks is urging patience. Threats are good. Action is better. Looking is good. Fixing would be better. Residents are tired of being patient. Three years of smelling the acrid stench, worrying about the problem, their health and their property values have exhausted their goodwill. They want solutions. They deserve them. Mr. Koster has the power to start hitting Republic Services in the pocketbook. He should use it. 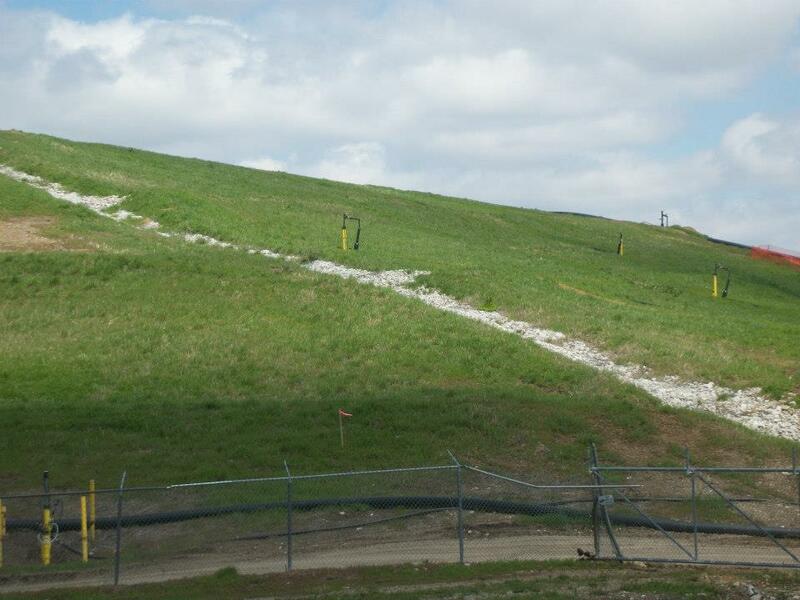 Dec. 18, 2013 – Bridgeton Landfill work crews continue to work on a clean-up of a leachate spill that occurred last week. Dec. 18, 2013 – Bridgeton Landfill work crews continue to work on a clean-up of a leachate spill that occurred last week. Heavy construction work related to installation of additional gas extraction wells (8 remaining to be drilled) and EVOH capping material on the North Quarry has stopped as a result of the inclement weather and is planned to restart in mid-February 2014, weather dependent. Work continues on the new leachate conveyance line and on the leachate pre-treatment facility including the four 1-million gallon leachate tanks. Dec. 18, 2013 — Air Monitoring Results — Air monitoring activities continue as the department collects data via our AreaRAE system on a 24 hour per day/7 day per week basis. Daily monitoring events by the department continue to be completed twice per day on a scheduled path. 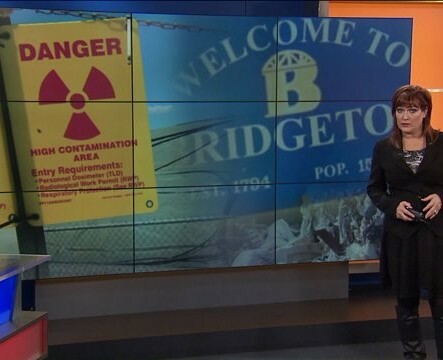 Has Radioactive Waste in the Bridgeton Landfill Reached the Ground Water? Wednesday, December 11, 2013 on The McGraw Show; Policy Advisor for State Representative Bill Otto; Harvey Ferdman talks about the newest report released on Monday regarding the finding of more radioactive waste at the Bridgeton / West Lake Landfill. To watch the interview, please click the link below. Thursday, December 12, 2013 check out McGraw’s interview with Steve Stenger regarding West Lake Landfill. It starts around the 2:40 mark. Nov. 22, 2013 – While inclement weather prevented drilling on Thursday, Nov. 21, Bridgeton Landfill reported 21 of 30 gas extraction wells and all of the toe drain collection sumps for the North Quarry area have been completed. Bridgeton staff advised the heavy construction work has been suspended until after the Thanksgiving holiday. No construction activity is planned on the four 1-million gallon tanks next week while concrete work is completed on the containment area. Gas extraction well drilling activities are scheduled to resume on Dec. 2, weather permitting. Bridgeton Landfill staff noted that routine facility monitoring and related operational maintenance activities will continue without interruption. A brief update was also provided on the Gamma Cone Penetration Test. Forty-one of the sixty-nine proposed soundings in the original work plan are complete. The work continues with a pace of approx. 5 soundings being completed per day. Work on the GCPT will continue through Nov. 26 and then will resume on Dec. 2. BRIDGETON • The West Lake Landfill is, in reality, an unregulated radioactive waste dump that should be cleaned up under the same federal program as similar St. Louis-area sites contaminated with World War II-era uranium processing residues, a nuclear industry critic said in a report. The 17-page report issued Thursday isn’t based on new data. Instead, it draws from dozens of studies that go back more than half a century. The report was prepared for the Missouri Coalition for the Environment by Robert Alvarez, a former congressional investigator and adviser to three energy secretaries during the administration of President Bill Clinton. 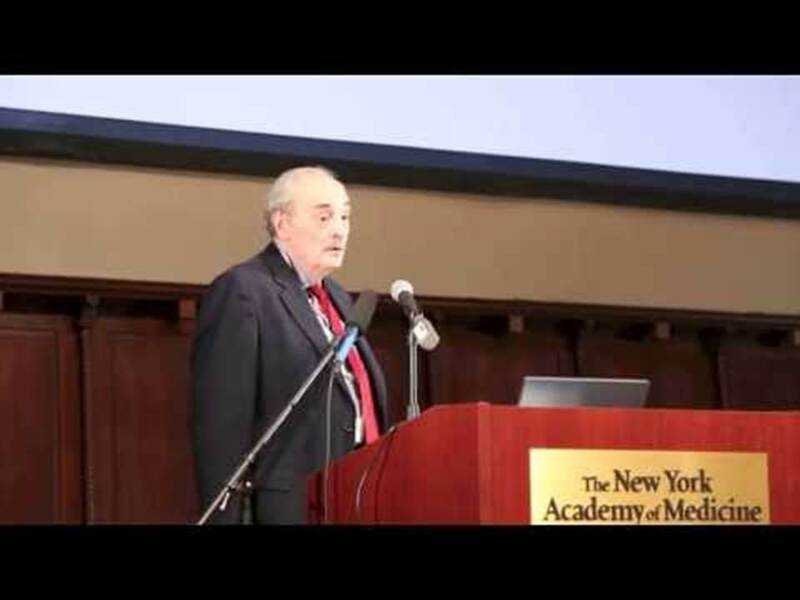 An outspoken critic on nuclear waste issues, Alvarez presented his analysis at a public meeting Thursday night in Bridgeton. 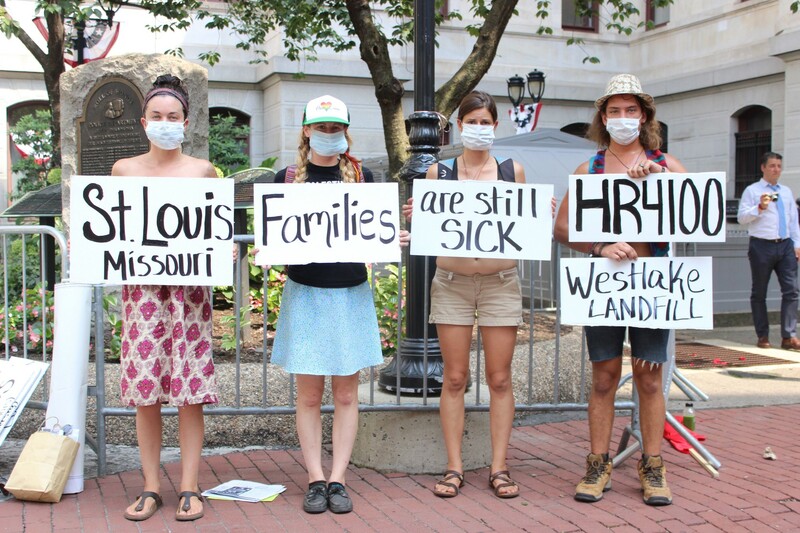 Alvarez joins a chorus of area residents, environmental activists and local officials calling for responsibility for the cleanup at West Lake to be transferred to the Army Corps of Engineers, which is cleaning up similarly contaminated sites across St. Louis. The calls for action at West Lake have grown louder because of a subsurface fire smoldering deep within the adjacent Bridgeton Landfill. Alvarez said the EPA, which took over responsibility for the site almost 20 years ago, continued to rely on incomplete information and incorrect assumptions that underplay risks posed by radioactive materials dumped 40 years ago. “The EPA never questioned what I call ‘the official story’ of what went where, so I started to look at that a little bit more carefully,” he said. Alvarez said the EPA’s 2008 decision to leave radioactive wastes at West Lake in place beneath a rock, clay and soil cap ignored the fact that the site was in the Missouri River floodplain, in a populated area. “To assume that none of this stuff will ever migrate is just not supportable,” he said. The EPA’s 2008 decision is currently being reevaluated with no set timetable for issuing new cleanup plans. An EPA spokesman couldn’t be reached Thursday evening. Alvarez agrees with the EPA on one point. Transferring responsibility for the cleanup to the Corps of Engineers requires congressional action. Jeffrey Tomich covers energy and the environment for the Post-Dispatch. Follow him on Twitter at @jefftomich. 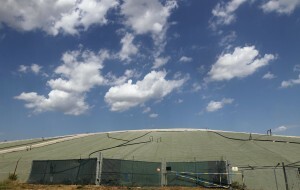 ST. LOUIS–(KMOX)–An environmental group is warning a new underground fire could be forming at a Bridgeton landfill — closer to buried nuclear waste than the current fire. 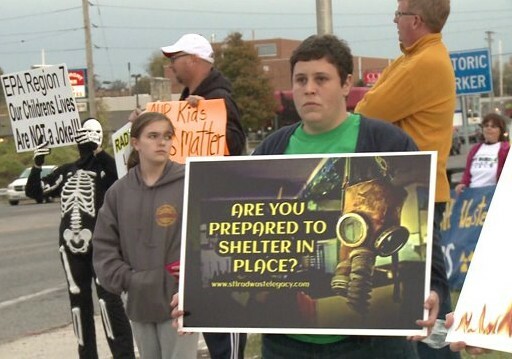 The existing underground fire at the Bridgeton Sanitary Landfill was last reported about twelve-hundred feet from the West Lake Landfill nuclear site. Now, the Missouri Coalition for the Environment is worried about elevated temperatures at a gas extraction well it claims is just 750 feet from the edge of the West Lake landfill. 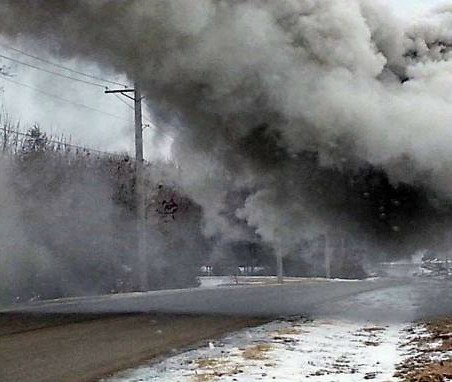 Since this spring, the landfill owners, Republic Services Inc., have carried out a court-sanctioned plan to try to put out the underground fire in the south quarry. Public officials, including the Missouri Attorney General, have talked about having time, if necessary, to dig an emergency trench to separate the fire from the nuclear material before it ever gets too close. “The possibility of a north quarry fire is more likely now than at any other time, based on the data we’ve seen,” Smith said. Data from the Missouri Department of Natural Resources website shows the temperature at the well in question — Gas Extraction Well #54 — peaked at 155 degrees Farenheit on June 18. The past four weeks the temperature there has fluctuated between 143–146 degrees. Smith claims a temperature of 170 degrees would be considered an underground fire. Smith says when Callow claims the latest hot spot is 1,200 feet from the nuclear waste, he’s guessing at how far over the boundary line the nuclear waste lies buried. 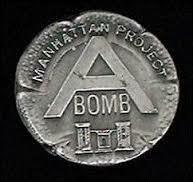 “He can’t say with certainty where the nuclear material is buried, because he doesn’t know,” Smith said. Smith says the possibility of a new fire starting closer to the nuclear material raises questions about whether firefighters would have enough time and space to keep it from spreading to nuclear material. “The risk will be there that if a landfill fire hits the radioactive waste, you could have the possibility of smoke leaving the site, carrying with the wind and moving radioactive materials with the smoke and debris,” Smith said. 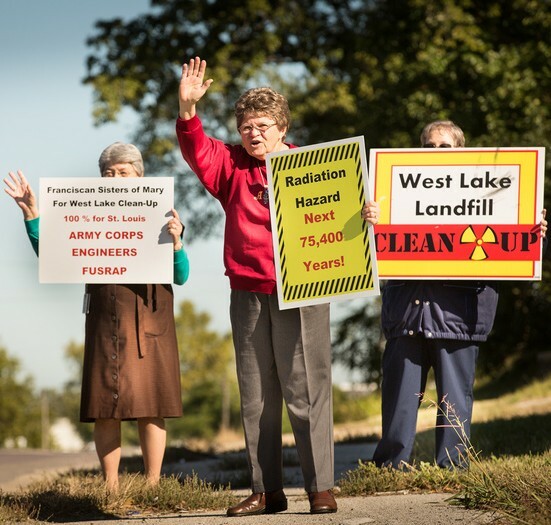 The Coalition for the Environment is calling on the Missouri Congressional Delegation to push for the complete removal of radioactive material from the West Lake Landfill. So far, Senators Blunt and McCaskill, and Congressmen Clay and Wagner have voiced “concerns” about the situation, but stopped short of calling for the removal of nuclear waste from the site. The Missouri Department of Natural Resources did not return calls seeking comment on the story. 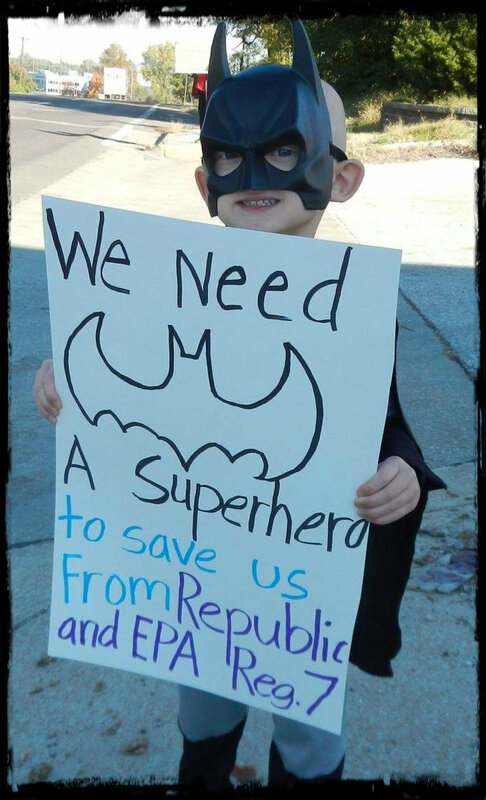 Republic submits 2nd contingency plan to MO DNR. 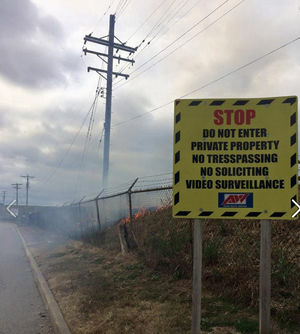 Republic Services has submitted a second ‘Contingency Plan’ to the Missouri Department of Natural Resources (MO DNR) for dealing with the fire at Westlake Landfill in the event that the fire reaches the Isolation break. The link to the full contingency plan is located here (in PDF format, so you will need Adobe Reader installed to read it). confirmatory testing or perform independent testing to confirm the trigger reading. BRIDGETON, Mo. (KMOX) – A prominent fire commander is calling for the removal of nuclear waste from the West Lake Landfill in Bridgeton as his department monitors an underground landfill fire nearby. “We need to quit talking about it and take action because it is something that is very serious,” Pattonville Fire Protection District Assistant Chief Matt LaVanchy says. 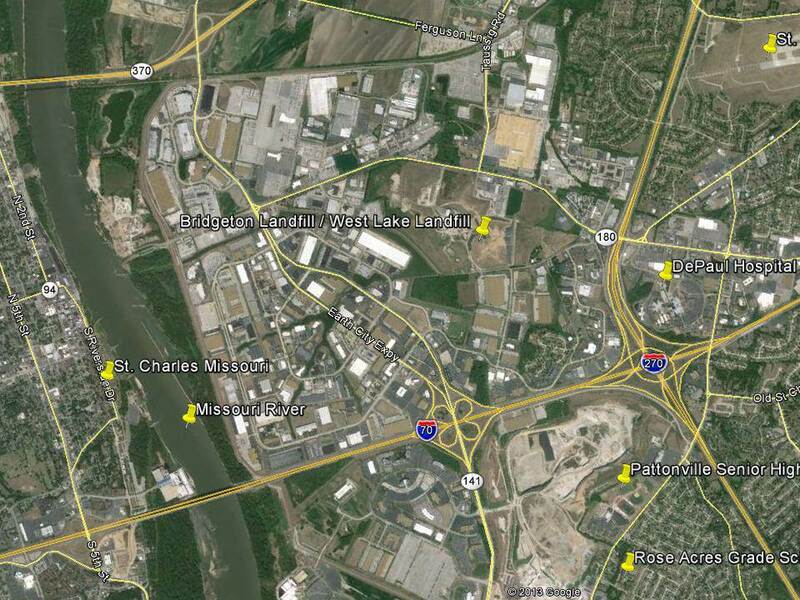 According to LaVanchy, the entire St. Louis metropolitan region would be threatened with radioactive smoke if the fire at the Bridgeton Landfill were ever to reach the nuclear site at West Lake. If that occurred, according to LaVanchy, radioactive isotopes would leach onto smoke particles, carrying the airborne nuclear waste in whichever way the wind blew. LaVanchy says in the short term, a trench needs to be dug to create a fire break. In the long term, he says the nuclear waste needs to be removed before another fire at the Bridgeton Landfill starts. Later this week, the owners of the landfill are expected to present a revised plan to stop the fire from spreading toward the nuclear waste. Could Dooley Do More to Rid County of Nuclear Waste? BRIDGETON, Mo. 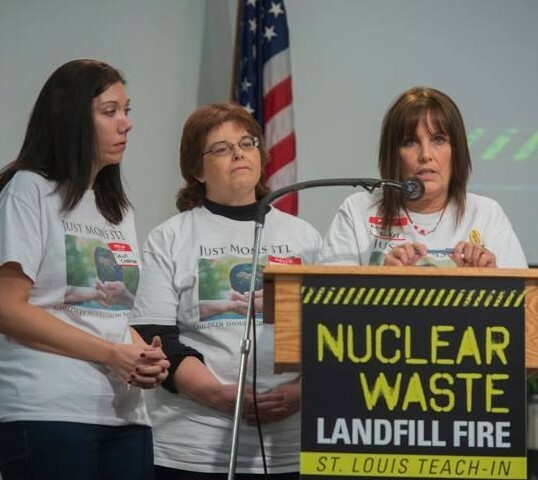 (KMOX) – With an underground landfill fire burning near a nuclear dump site, activists want St. Louis County Executive Charlie Dooley to champion the removal of nuclear waste. 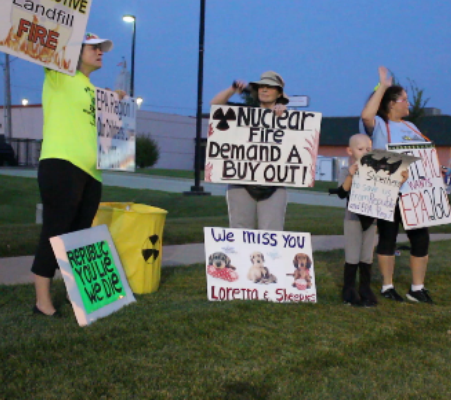 “People want this radioactive waste removed,” said Dawn Chapman, a Maryland Heights mother of three who helps run a Facebook page on the West Lake Landfill. 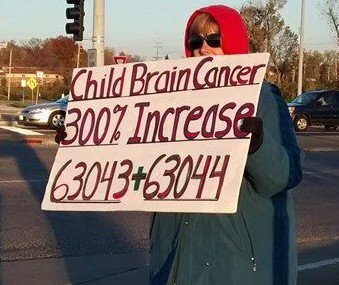 Chapman says among the north St. Louis County residents she regularly meets with, there is a growing alarm over the status quo of raising children near a nuclear waste site. Chapman says Dooley could use his bully pulpit to call on the Missouri congressional delegation to make it a priority to permanently remove all the nuclear waste. 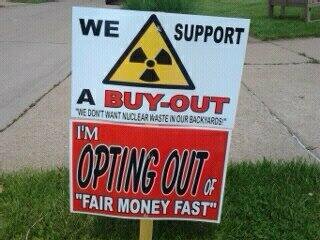 An environmental group that has been closely following the West Lake Landfill agrees. A Dooley spokesman says it’s not unusual for the County Executive to leave a symbolic resolution unsigned. 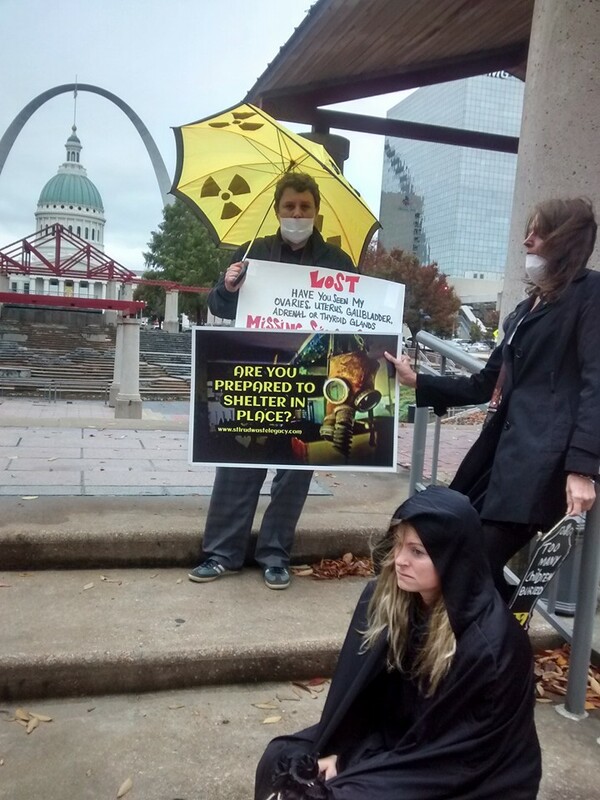 In late July, KMOX asked Dooley about concerns of residents and activists that he is taking too low a profile on the nuclear waste issue. Dooley’s position angers Chapman, who says the County Executive could do much more. 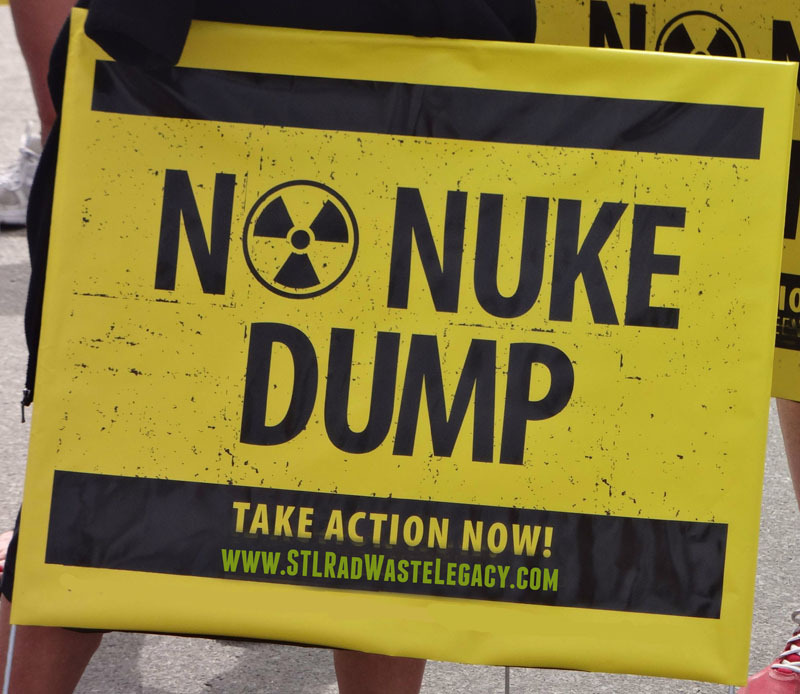 KMOX made an open records request to St. Louis County for any correspondence with the Missouri congressional delegation, the EnvironmentalProtection Agency, or any other agency requesting that the nuclear waste be removed from the West Lake Landfill. A Dooley spokesman says there is no such document. While he has stopped short of pushing for a nuclear cleanup, Dooley did sign a letter sent just last week to the EPA raising concerns about radiation in ground water near the West Lake and Bridgeton landfills. “St. Louis County is aware that radium contamination has been detected in groundwater samples around the Westlake and Bridgeton Landfills. St. Louis County also understands that the radium contamination is not anticipated from the known contaminants deposited in those landfills. The purpose of this correspondence is to stress St. Louis County’s concerns about the source and extent of this radium contamination. St. Louis County recognizes that EPA VII is working with the environmental and health agencies of Missouri to try to resolve the radium presence. St. Louis County is also aware that the USGS is partnering with EPA VII on the Westlake efforts. St. Louis County strongly encourages EPA VII to work with its partners to expeditiously determine the source and extent of the radium contamination as well as its acute and chronic health effects on residents of St. Louis County, especially those in the immediate proximity of the two landfills. We continue to have great concerns regarding the subsurface smoldering event at the landfill and the potential environmental and health impacts this event has created. In addition to the letter sent last week to the EPA, Dooley’s Health Director Dr. Dolores Gunn sent two emails in January to state agencies requesting more study on the Bridgeton and West Lake landfill crisis. KMOX on Friday requested an interview with Dooley to respond to concerns about his handling of the Bridgeton landfill crisis. He did not call back.